Russell Martin has been promoted out of every division in England... except League 2, and he wants to complete the set with MK Dons this season. 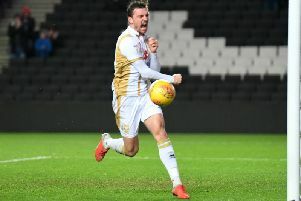 The 33-year-old won promotion ahead of MK Dons from League 1 to the Championship while with Peterborough in 2009, before going back-to-back with Norwich, who jumped from League 1 to the Premier League in two seasons. Another promotion from the Championship to the top flight with the Canaries followed in 2015, leaving just League 2 to tick off his list. Having signed for Dons in January, Martin has been an almost ever-present in Paul Tisdale's side, and says the dressing room has a real drive to make his fifth promotion a reality. 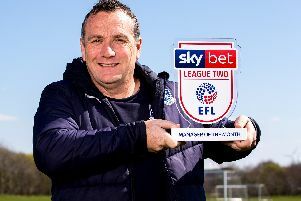 "I think this will be number five and the first out of League 2, so it will complete the set, but it would be brilliant," he said. "It could be my last one, I'm in the tail end of my career. I want to enjoy it, but I want to make sure it happens first. We've put ourselves in a great position, and we have to make sure we continue that in the last five games." With Martin's experience of promotions through his career, the defender says nerves are inevitable, but he knows what sort of mentality it takes to get through the final five games as the season nears a conclusion. He said: "As much as we feel it, so will the others. We've got a lot of experience in that dressing room, and it will be called upon. It will stand us in good stead. But we're only focused on us, and it's another big game this Saturday. "I was saying to Callum Brittain, I'd much rather be in this position, with games meaning something. Fighting to achieve something, win promotion, it's a brilliant place to be. It might not come around again. It is to be embraced. If you don't feel nerves, you shouldn't be playing the game!"